Is it worth putting speed EVs into Honchkrow? or is it better to build a more defensive Honchkrow? is this for wifi battles? As you can see, it has horrible defences, and only moderate speed. With some EVs in Speed, you may outspeed threats, but investing them in defences is not a good idea. I am sure damage calculations will prove my point, but even without that, it is easy to see that Honchkrow doesn't last too long. It can, however, make good use of Sucker Punch, and its other moves. 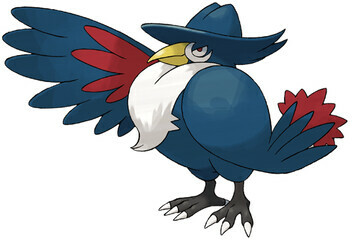 Honchkrow may even run Substitute, but with those defenses, I suggest max speed and spray, and pray, baby. I agree with everything in this answer aside from the set so I'll provide an alternative (as opposed to wasting my time in writing a new answer), the "standard" set. Honchkrow does have a nice special movepool and a usable special attack stat but investment in special attack isn't necessary. Heat Wave is viable though not recommended. Even if you do chose to opt for Heat Wave over Superpower, no special attack investment is needed because Heat Wave is not a primary attack (mainly for stuff like Foretress). Honchkrow has excellent attack and a passable movepool to get the job done so I'd go down the physical route. What is a good moveset for Honchkrow? Which status move would be the most useful on a competitive Honchkrow?